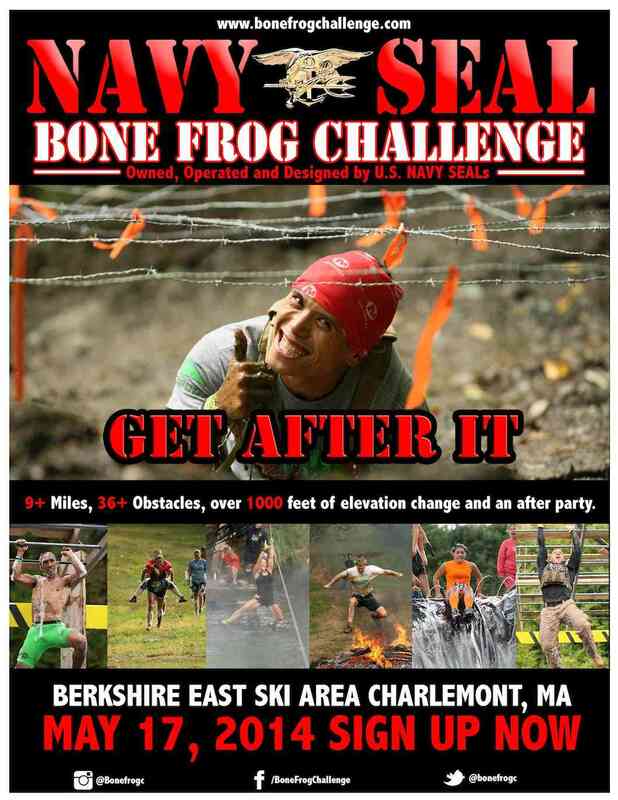 Bone Frog Challenge (Charlemont, MA) | Mud and Adventure | Outdoor Active Adventures Begin Here. The Story. The Bone Frog Challenge was created by Navy SEALs to challenge, build and inspire participants to become better athletes and recognize that they can do anything they set their minds to, while enjoying the camaraderie and teamwork usually reserved for active duty Navy SEALs. The Experience. The Bone Frog Challenge is truly a unique experience. Our events kick off with the SEAL Wave Fridayafternoon during which a very limited number of entrants enjoy the course and camaraderie with Navy SEALs. The minimum SEAL-to -participant ratio is 1:10 in the SEAL Wave, and 50% of the entrance fee for this wave goes to the Navy SEAL Foundation. Saturday is the primary race day. Waves start every 15 minutes from 9am-4pm. The Course. With at least 36 military-style obstacles on courses that range from 9-12 miles, the course will test everyone and leave no one unscathed. We place an obstacle about every quarter mile, so your running ability alone will not carry the day. You must be functionally fit to succeed here. You will get muddy. You will get beat up. You will be exhausted. But you will finish. Did we mention sand? You will get to know what it means to be “wet and sandy” just like we were at BUDS. As Navy SEALs, we know what tough is – and we don’t mean Harvard. The After Party. While we do not believe that the “after party” should be the focus of the day, we have always subscribed to the “work hard, play hard” mentality. We have planned and executed hundreds of combat missions – no one can plan like we do! From awesome music to enough first-aid stations and great food, your experience with the Bone Frog Challenge will be one that you will remember for years to come. Relay Team or Individual. Our event will foster camaraderie, period. Form an official relay team ahead of time or link up with others when you get here. Family Event.. As Navy SEALs we have been forced to spend a great deal of time away from our families. As a result, whenever we can, we include the entire family in all that we do. The Bone Frog Challenge event weekend offers fun and activities for all ages. Let the kids come watch you race and then let them loose in our Mini Bone Frog Challenge Kids Area where they can play in the mud and on scaled down obstacles.